Heron Cam ﻿ Watch the herons here! On May 22, 2011 a tornado struck north Minneapolis and North Mississippi Regional Park, damaging an island that was home to a rookery of roughly 200 Great Blue Heron nests. A rescue operation quickly mobilized, and 13 chicks and one adult heron were rescued and released. The adults that had left the roost -- as it turns out -- relocated quickly. 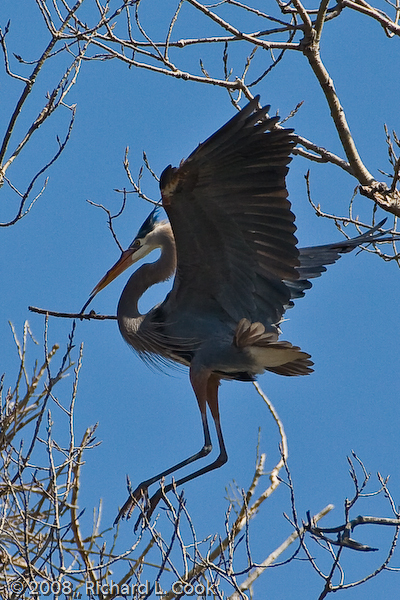 On June 6th of 2011, Xcel Energy staff at the Riverside Plant in Marshall Terrace announced that blue herons had shown up on a small island downstream and were establishing a new home. Xcel Energy has since installed a "Heron Cam" for remote viewing of the rookery. It's the newest addition to the Xcel series of Bird Cams. While it's available year-round, the best viewing of the herons is in the spring when they return to their nesting colonies. Great Blue Heron. Photo by Richard Cook, 2008.